Turkey Pizza Stuffed Peppers is Italian spiced turkey & tomato sauce stuffed into peppers, topped with cheese & pepperoni. Low carb, Weight Watchers friendly- 4 SmartPoints! Let’s be honest, pizza is one of the best food ever. If you ask my husband, pizza would likely be one of his last meals. I crave pizza often but it’s definitely not as Weight Watchers friendly as I’d like. Luckily I can have the pizza flavors I love without the heavy carbs. My Turkey Pizza Stuffed Peppers have all the delicious flavors of pepperoni pizza without the guilt. 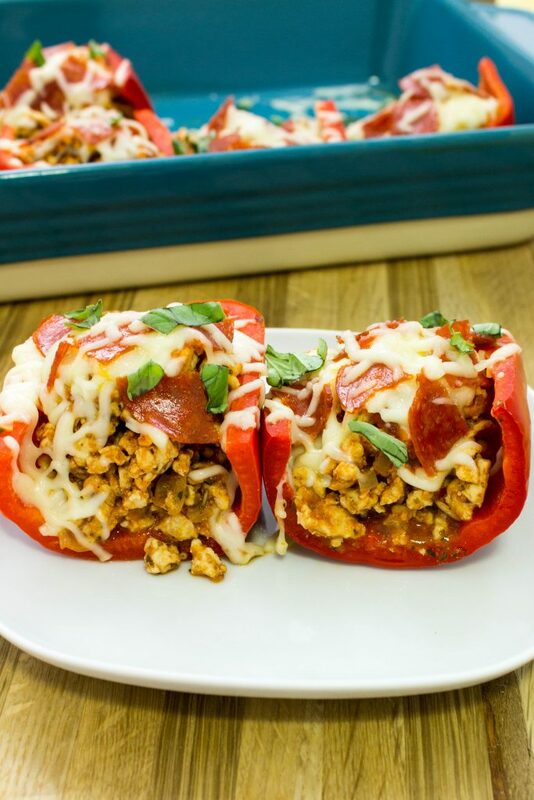 Italian spiced turkey and tomato sauce stuffed into bell peppers, topped with layers of cheese and pepperoni are the perfect low carb dinner! This is a Weight Watchers friendly recipe and each serving is 4 SmartPoints. I’m always looking for ways to turn comfort food into lighter versions. My all-time favorite comfort food is mashed potatoes and I turned that into my Garlic Mashed Cauliflower. Another one of my favorite comfort foods is pizza. And to be honest, I didn’t start really, really loving pizza until my husband and I started dating. He is pizza obsessed…. I really think he could eat it every day. Lucky for him, he has me to help him NOT eat the carb loaded food every day, otherwise he’d be super unhealthy. A while back, we were both craving pizza but had splurged a bit over the weekend with eating out. I love using bell peppers as a low carb alternative when I’m turning a guilty pleasure into a guilt free meal. This is the inspiration for this recipe. I’ve made cauliflower pizza crust before, but for this recipe I wanted to use bell peppers as a vessel for the pizza goodness. The base of these stuffed peppers is ground turkey. To a skillet, sauté onion and garlic then add ground turkey. Cook the turkey until browned, breaking up until small pieces. Once the turkey is cooked, add tomato paste, tomato sauce, Italian seasonings, and red pepper flakes. This is what gives the turkey that pizza flavor!! Remove the stem from the red bell pepper, gently remove the seeds and the membrane from instead the pepper, and then cut the pepper in half. Remove 4 times! Lay the cut peppers into a casserole dish then spoon the turkey mixture into the peppers. Spoon more tomato sauce on top of the turkey mixture then pour ½ cup of water into the bottom of the casserole dish, cover the dish with foil, and bake for 35 minutes or so until the skin of the peppers are tender. Adding water to the bottom of the dish helps the peppers to steam and cook faster. Remove the casserole dish from the oven, sprinkle the top with ½ cup shredded mozzarella cheese, pepperoni pieces, then more cheese. Bake for an additional 10 minutes then garnish with basil! 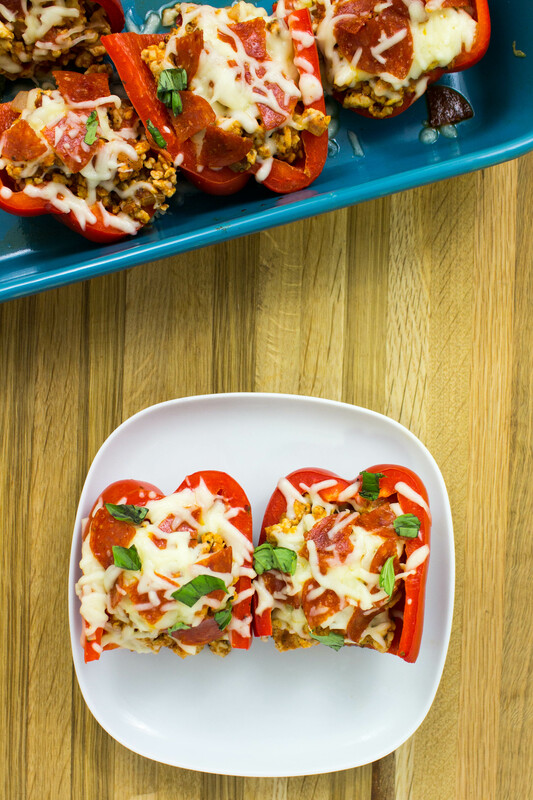 Turkey Pizza Stuffed Peppers have all the delicious flavors of pepperoni pizza without the guilt. 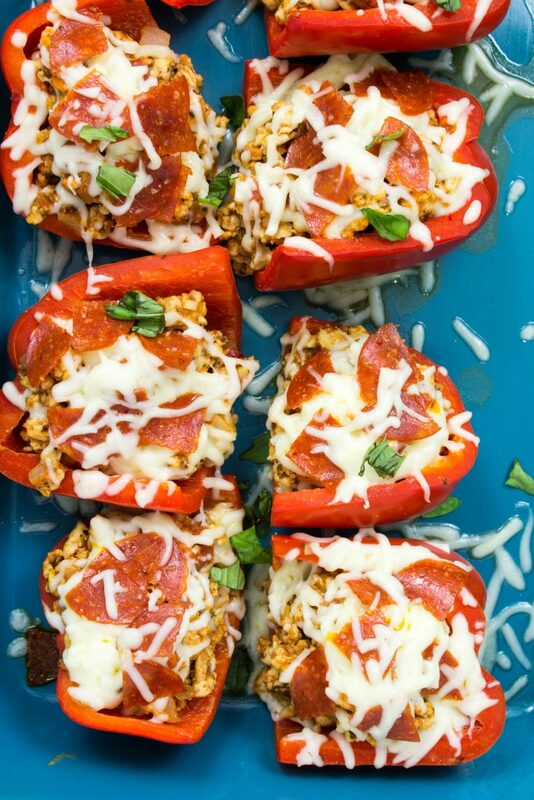 Italian spiced turkey and tomato sauce stuffed into bell peppers, topped with layers of cheese and pepperoni are the perfect low carb dinner! Ready in under an hour. These make great left overs too! 4 Weight Watchers SmartPoints for 1 whole pepper! Cut pepperoni slices into 4 pieces and set aside. 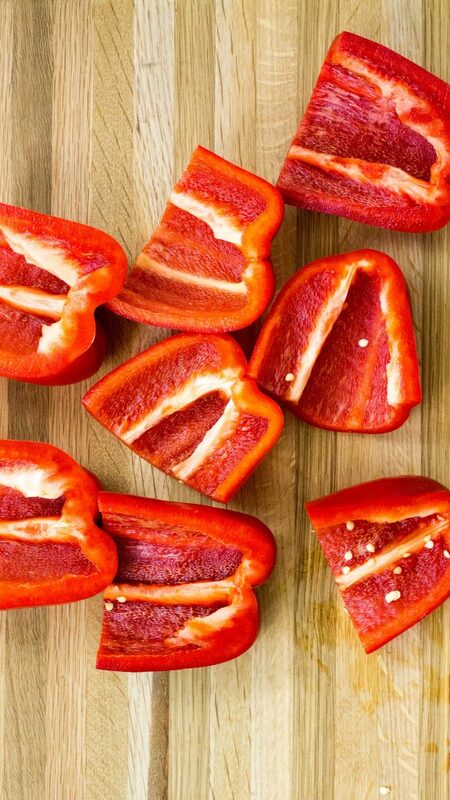 Cut off stems of bell peppers and gently remove the seeds and membrane inside the peppers. Cut peppers in half and set into casserole dish. Add onion to skillet and sauté onion for 7 minutes until translucent. Add garlic to skillet and sauté for 1 minutes. 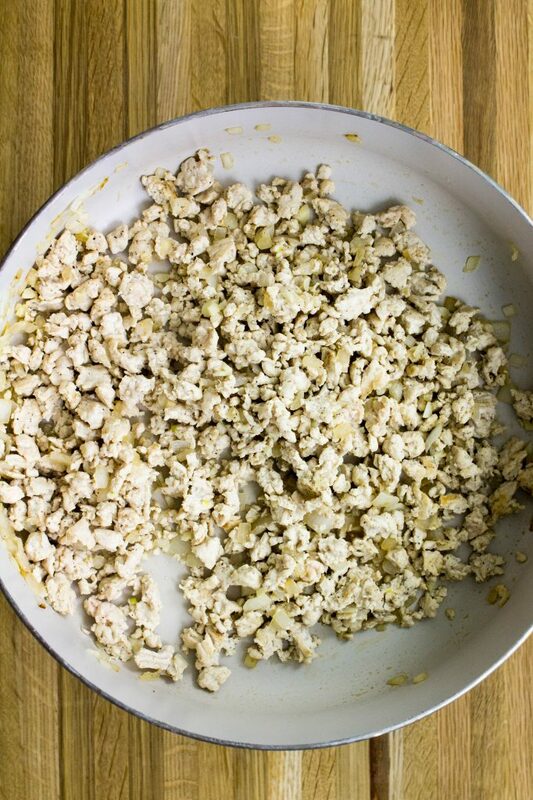 Add ground turkey to skillet and cook until browned, breaking up into small pieces. Season with salt and pepper. Add tomato paste and mix until well combined. Add Italian seasoning and red pepper flakes and mix until well combined. Add 1 cup tomato sauce and mix until well combined. Let cook for 4 minutes then remove from heat. Spoon the turkey mixture into the red bell peppers in the casserole dish. Spread ½ cup tomato Sauce over top of turkey mixture. Bake for 35 minutes until the pepper skins are slightly tender. Sprinkle with a little bit of cheese. Layer 8 pieces of pepperoni on top of the cheese, then sprinkle remainder cheese on top. May 26, 2017 at 10:31 am These look so good! 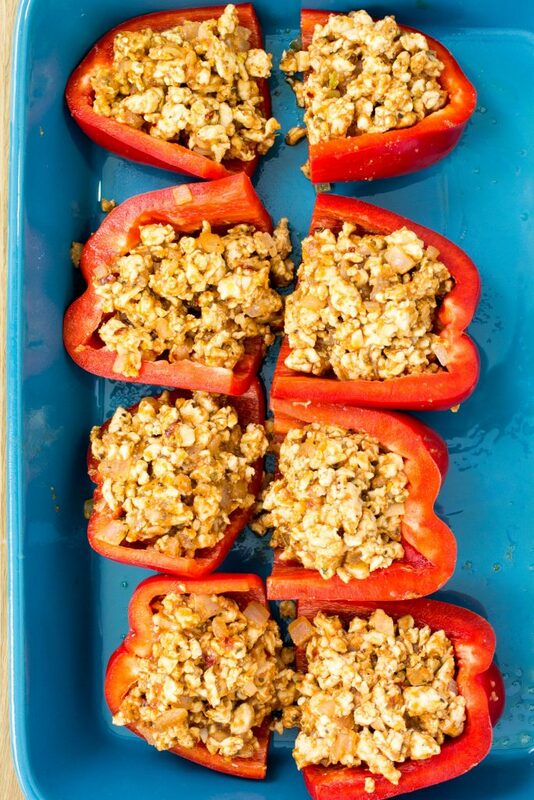 What a great idea and different twist to stuffed peppers. 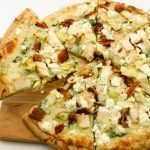 May 30, 2017 at 12:49 pm Yes, such a great gluten free recipe!! Thanks Marie! May 26, 2017 at 12:12 pm Aww man! This is totally pinned. I am definitely going to try this soon! May 30, 2017 at 12:48 pm Oh awesome! Thank you for pinning Nicole! May 26, 2017 at 12:44 pm Oh my gosh how delicious! I've done turkey taco stuffed bell peppers, but I love the pizza take! 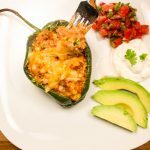 May 30, 2017 at 12:48 pm Yes, it's such a great way to change up those Mexican stuffed peppers :) Thanks Lona! May 26, 2017 at 2:24 pm Wow! These look incredible!! I may be trying them next week. May 30, 2017 at 12:47 pm I hope you do! Thanks Jessica! May 26, 2017 at 4:53 pm This looks great and can work with so many different food plans! May 30, 2017 at 12:47 pm Awesome!! Thanks Marya! May 26, 2017 at 6:09 pm Great idea, cutting the peppers and stuffing them from the side...Why have I never thought about that!? I just bought me 2 basil plants today, so pizza seems like a natural choice!!! May 30, 2017 at 12:46 pm Oh perfect!! I just planted basil too so I love having it fresh on hand for recipes like this. Thanks Jennifer! May 30, 2017 at 12:46 pm I'm always looking for pizza alternative too :) Oh thanks for signing up for the newsletter and for the kind words Larissa :) !!! May 26, 2017 at 9:26 pm wow that sounds seriously delicious! May 27, 2017 at 6:57 pm This looks like an amazing healthy dinner! Can't wait to make it. May 30, 2017 at 12:44 pm Me too! I was burnt out on Mexican stuffed peppers so I needed a change :) Thanks Danielle! 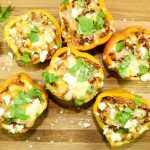 May 29, 2017 at 1:22 am I love peppers. I am trying your recipe. My husband and daughter would enjoy this.